In the spirit of Thanksgiving, I wanted to post two special awards that I have received. For, I want to pass them on to my very special blogging friends, who are at the top of my list of things I am thankful for! I'm sure y'all won't be surprised that the beautiful award at the top just has me eager as heck to put it on my blog. It's doggies! I love me some doggies... any kind... any shape... any size... love em... just love em! But, you already knew that, didn't you? That's probably why I received this award twice - both from Tammy at Mom Knows Everything (who has given me a couple more awards recently, which I will post soon) and Sandee at Comedy Plus. They are just going to look absolutely adorable on my blog! Sandee also gave me this adorable award. I don't think anyone can ever have too many adorable animals decorating their blog. It was kind of funny, because I saw this award at another blog and thought how cute it was (and secretly wished that I would receive it to put on my blog)... and then... Ms Sandee comes through and blesses me with this award. Click "Read More" for a gift from me to you and the list of who receives these awards. I posted this poem over at Misty's Words, but that blog doesn't have many readers, so I'm going to post it here to all my friends. Please know how very special you are to me and how thankful I am for this opportunity to discover all of these wonderful friendships. my words to you are always true. you friend I will always be. Believe it or not, all of the above things can be performed virtually... across the cyber-blogosphere wires. I know, because you have all done these things for me. Each one of you is a special and fantastic individual. What adorable awards! I loved your poem, too. I think I'll run over to your other blog and subscribe now, so I don't miss anything good. I gave you that first award, too! I knew you'd love it. Thank you Misty so very much for these awards. I am truly touched. thank you so much Misty. I am so glad that I met you because you have touched my life in so many ways!! Have a great Thanksgiving and thanks for the award. That is so beautiful and so sweet of you! And you're right, this awards are going to look fantastic on my new layout! Of course I still need to do something with the other one you gave me - I am so slow!!! That's truly very sweet of you. I appreciate it very much. Thanks for this lovely poem. 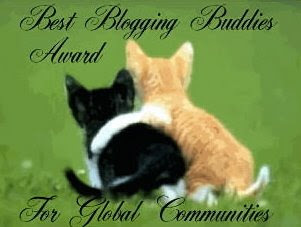 Thank you so much Misty for the awards I will get a post done later on tonight. Beautiful poem, great picture and so many generous honours all round the world. Thank you for spreading your cheer and I hope you have a great Thanksgiving. Awwww - thank you so much!!! I love the puppies! Thank you Misty! I love this award too, and I have a feeling it will be on it's way back to you! Have a happy Thanksgiving! Thank you for the awards, your poem is beautiful!! Have a happy Thanksgiving:) Hugs! Gosh Misty another award to thank you for! THANK YOU! I know without my internet friends my attitude and the state of my emotions would be bad. Very bad. Thanks for being my most fervent, faithful and friendly reader and pal. Terrific poem, and thank you for the award! Your blog is really lovely, you know. It's obvious that you have a lot of love in your heart and in your life -- it's reflected in your writing. Awwww, thank you so much!!!!! I'm thrilled that I received them. You are so right, friends come in all shapes, sizes, AND places. I never would have thought I'd make friends starting a blog for my brother. But, friends I have made!